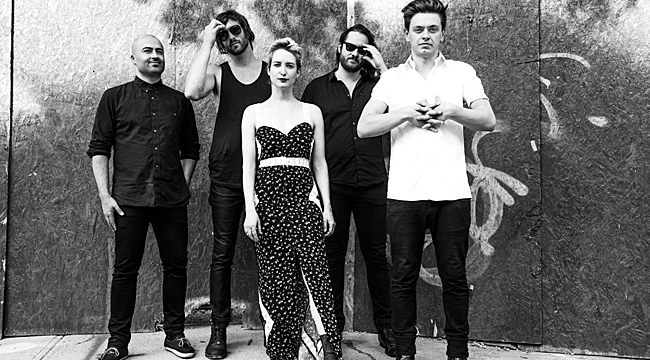 The Canadian rock band July Talk formed after Peter Dreimanis and Leah Fay met cute, as they like to say in Hollywood. The two recruited guitarist Ian Docherty, bassist Josh Warburton and drummer Danny Miles for their 2012 self-titled debut, an album of grunge-y garage blues tunes that show off the contrast of their voices. (He sounds like Tom Waits and she could pass for Nancy Sinatra.) A version of that album has finally been released in the States and the group is currently on the road in support of it. Dreimanis and Fay called us from just outside of Boston at the beginning of the tour. You promised to call and thank any young adult who voted in the recent Canadian federal election. How’s that process been going? Peter: It’s pretty fun. It makes phone interviews feel very different once you spent a day on the phone talking to strangers. We’ve had a blast doing it. We got a great response. I don’t know what the voter turnout is like in the States but in Canada, it’s really, really low. It’s under 40 percent. We wanted to do something about it. The voter turnout here is low as well. But when young people vote they tend to vote for the types of politicians who turn out to be good leaders. Peter: It’s the idealistic point-of-view that’s missing from the political landscape. You haven’t been punched in the face as many times and you haven’t fallen down as many times. Leah: When you’re young, it’s easy to be apathetic because you feel as though you’re being alienated. It’s hard to see yourself represented by the type of people running the country and all of North America. It’s hard to be like, “These people care about what I have to say and what I think.” The first time I voted was because Puff Daddy said if you don’t vote, you can’t complain. I think there was an American election going on at the same time as the Canadian election. Talk about how the band first came together. Is it true you met Leah at a bar? Peter: Totally. I had been playing in another band that was coming home from a European tour. Our drummer was also in the band. It had just imploded when I came home. I was writing stuff that had a conversational quality to the music. I walked into a bar and Leah, whom I had never met before, was sitting in the back corner. She had a bicycle helmet on and was covered with face paint. She also had a guitar. To make a long story short, I listened to her play and I played a song we ended up turning into “The Garden.” She took off, and I had to track her down. Once I did, she agreed to play some music and try some stuff. Right off the bat, we knew he had no interest in being a folk Simon-and-Garfunkel-type of duo. We wanted to have a rock ‘n’ roll band that was loud and dynamic and something like Crazy Horse. Josh [Warburton] came through. He owned a film company. He is an incredible songwriter and musician. Danny [Miles] came over from the other band and it was a quick thing. We were into making an album in six months. It really wasn’t long. It was baptism by fire. What did the two of you have in common? Leah: Music and songwriting. Peter comes from a different part of Canada. I’m from the East and he’s from the West. Musically, it’s like getting someone from New York or Boston together with someone from Dallas or Austin. We had different musical knowledges. Part of getting to know each other and starting the band was figuring out what we liked and didn’t like and what we shared and could teach other. Did you know from the beginning that you’d trade off vocals? Leah: The band I was in prior was me and another vocalist who shared everything. Peter was in bands where he was playing keys and doing backup vocals. Neither of us had been the sole frontperson of a band. I think it was a comforting thing to know that the responsibility wouldn’t fall solely on one person. We didn’t even talk about it. Peter: It was easy. The first day you sit down with this person and you’re playing through a song that was written by one voice. You change it around slightly and the lines mean something completely different. They hold so much conflict just because two people are singing them to each other. You can do that to any popular song. Quickly, that novelty grew into a bit of an obsession between the two of us and between the whole band. You can imagine writing for this band is so much fun. All the dynamics on the musical level have to match the conflict within the vocal conversation. It’s this Pandora’s Box once you open it. We don’t want to create Johnny and June or these traditional duets. The representation of gender and the representation of society is close-minded. We want to bring honest, specific lyrics about being our age and being us to a modern duet. Leah: When we first had band practices, we did some covers and they were never duet covers. They were song that were sung by one person. We did a Leonard Cohen “If It Be Your Will” and an Antony and the Johnsons’ song and “Bernadette” by the Four Tops. They’re all emotionally charged male songs. They’re not typical songs you would see two voices in. Peter: That was where the conflict comes from. The Canadian band Stars features singers who are very similar in tone. They have male and female vocals but they’re similar singers in terms of tone. It doesn’t come off as conflict right off the bat. You assume it’s a bit of a love song. When we started singing together, it was clear there was this harsh divide and everything we sing would come through that lens. We fought against that a bit. We don’t want there to be a pattern. With some of the newer material, we hit the nail on the head. Now, we’re writing new songs for our second album and we’re far closer to creating a well-balanced picture of what’s in our minds. That all came with the learning experience of doing it and doing it and seeing people’s faces. Sometimes, people see our shows and think we’re fighting and physically angry with each other. You don’t realize that every small move means something and is so important that we’re conscious of what we’re doing and use every one of our limbs and thoughts to shape what we’re saying to the audience. Once you put a man and a woman on stage, you’re automatically saying something. We’re really conscious of that. Leah: There’s been an act of unraveling. To start a band and have people say you’re sandpaper and gasoline. Beauty and the beast. Sweet lullaby and whiskey soaked. We’re just singing the way we sing. There has been conversation and experimentation and acceptance of that. The music has been described as garage blues. What sound are you going for? Peter: It’s changed a lot over the years. The album has had a few live spans and alternate versions. The American version of the album is a bit of a compilation. We boil it down to rock ‘n’ roll. Something that’s worked for most artists is not overthinking those things and not adhering to a genre. It’s where we belong. We love the Rolling Stones. We love personality. We connect to character like Iggy Pop and Patti Smith, people who have personality seeping through the music because they can’t stop it. That’s the rock ‘n’ roll we jumped into. There’s blues influence but that was born out of finding a common ground between indie rock in Toronto and country in Alberta. We end up in strange pop/blues conundrum. It’s like Harry Nilsson with this Delta blues background. We’re not tied to anything. Leah: Except for one song, they’re all recorded in Toronto at Dream House which is behind the Horseshoe Tavern. It’s called the Legendary Horseshoe Tavern. It’s one of Toronto’s oldest venues. Behind there are lofty buildings and our manager and the owner of our label started a studio there. That’s where we did all of the first album except for “I Rationed Well,” which is a couple of blocks down the road on Queen Street.